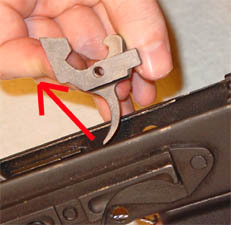 Finish rotating the lever in the same direction until the tab is above the FCG, by now the lever should be able to be removed by guiding the U shaped tabbed area out of the receiver through the special designed hole on the right side (ejection port side) of the receiver. With the safety lever removed take the needle nose pliers and grab the small bent part of the Shepard's hook (crook) and push it forward until it is removed. 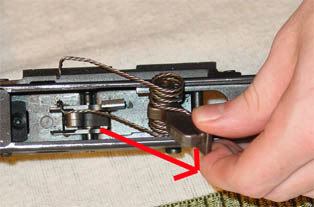 The hooked part of the Shepard's hook should pop out by the hammer axis pin against the left side of the receiver, grab it and pull it out in the direction shown. 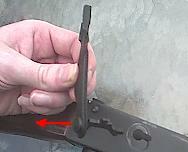 The Shepard's hook is used to keep the axis pins from backing out of the rifle while it is being shot, thus we must remove it to remove the FCG. Now that the Shepard's hook (crook) has been removed the rest of the disassembly should be easy. Now take your punch (or what ever your using) and place the rifle on a flat surface with the right side facing up (ejection port side) and tap out the hammer axis pin (b), leave the trigger axis pin (a) alone for now. With the hammer pin removed you should be able to reach in and grab the hammer and pull it out. 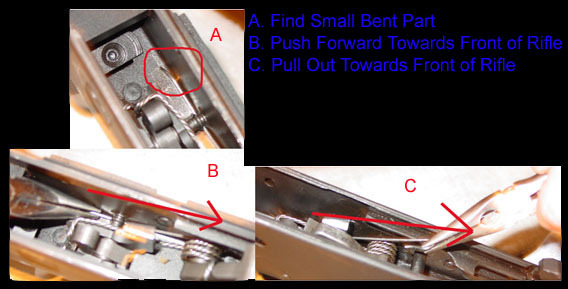 Make sure to un-attach the pieces of the hammer spring from the trigger. This can be done by just pushing down on them and moving them to the side. 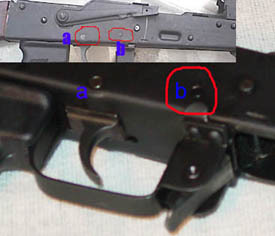 With the hammer removed place the rifle back on its side with the right side (ejection port side) facing up. Tap out the trigger axis pin, make sure to watch the disconnector and trigger carefully, because once you remove them, the little disconnector spring might fly off and you could lose it. If you haven't done so already, once the trigger pin is removed, remove the trigger and disconnector. And that's it, you have just removed your AKs FCG. Now installation is a different story. Click the link to Page 3 below for instructions on installation.